Odi et Amo: Natalie Umbert makes me happy. Last week I was flipping through the latest issue of Town and Country and saw this picture included in their feature on up and coming LA designers -- and I stopped dead in my tracks. Now this is the type of room that just makes me happy: bright colors coupled with lots of crisp whites and a great mix of patterns and styles. So of course I had to google the designer behind such a great room and boy was I not disappointed. Natalie Umbert's portfolio is, start to finish, just as jubilant, fresh and eclectic as I had hoped. 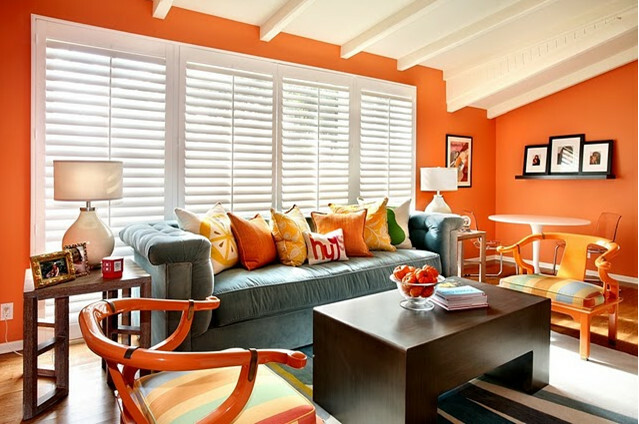 In short, I have a new design crush -- and a serious and new found appreciation for the color orange. I'm so in love with that window seat. And all the built-ins around the fireplace. Okay and those floors. I love the colorful patterned backs of these charges -- such a great injection of color into an otherwise neutral space. 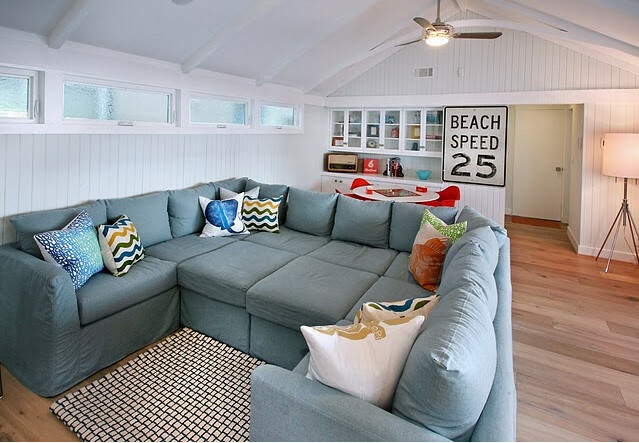 I also love the juxtaposition of the very casual floor and rug with the formal coiffured ceiling. Gauzy linen drapes and a capiz shell chandelier bring in a beachy vibe. I actually just got back from an all too brief trip to Pasadena, CA, late last night and I'm still definitely California dreamin'. The weather just could not have been better (or a more welcome respite from the humidity we've been suffering through all month). 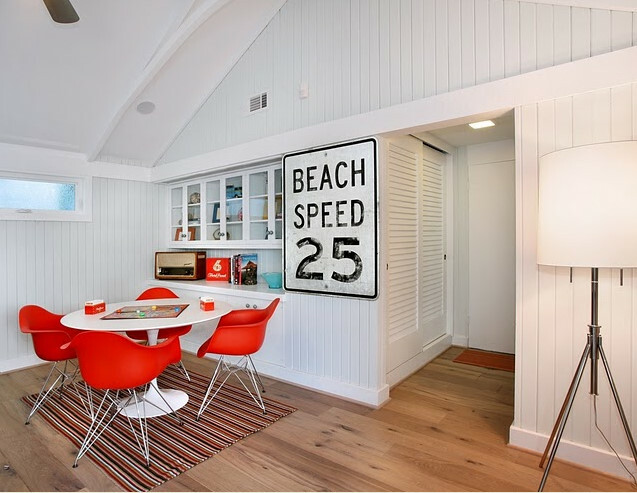 In any case, this room just screams California beach to me with its bleached floors, clapboard walls and brilliantly fresh combination of orange and aqua. So spot-on. The orange Eames Eiffel base chairs are a classic choice, done up more playfully in orange. I do wish the rug underneath the Saarinen table were a bit bigger though, I prefer a rug large enough to cover the floor area underneath the table and the chairs. More orange and aqua, but this time in a more saturated setting. I love how you can go with just a few hints of bright color set against a white backdrop for a calmer, more casual air or really go all out for some major drama. The palette stays the same, and yet the mood is so drastically different. The Chinese wishbone arm charms all done up in bold orange lacquer and fun stripes are my favorite elements in the space. Another view of the same room. Note how Natalie goes with just one large piece of art on one wall and a large mirror over the fireplace. I'm a big fan of using just a few large-scale pieces on your wall and with this bold wall color and all the ample patterns on the soft furnishings, not only do you want to avoid cluttering up your walls, but smaller pieces would really just get lost here. 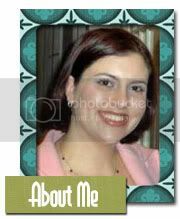 Natalie's portfolio has a separate section entirely devoted to children's rooms. I absolutely love how she picked up on the hot pink of the Serena & Lily bedding with just the narrowest of pink stripes on the walls. The wide spacing makes the small room appear larger and less busy than a more traditional stripe would have. When I first saw this room I couldn't help but think: "Okay, that's a pretty sophisticated kid's room", especially with the fairly tight black, white and silver color palette. The playful rug does inject a more youthful note, but it's the feature wall of silver-foiled wallpaper that I really love. Wow. I am in love! Thank you for introducing me to her work! Her work makes me happy too! Great use of color. Thanks for sharing. Very refreshing! Love the chairs with the orange patterned backs. Just like the comment above, wow! Love the use of color and scale, the oversized elements here in there, in lighting and accessories, really make the spaces. OMG....love it! I am looking her up right now!!! 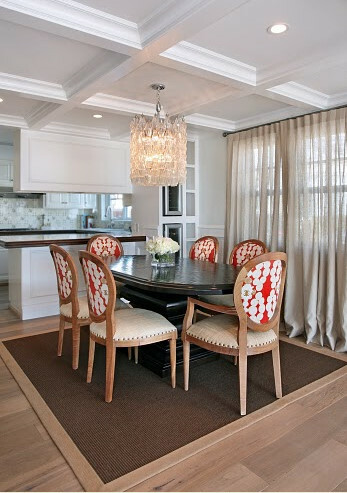 Love the dining room chandelier and chairs - the best! Wow! I love her use of colour, it's so refreshing when a lot of designers out there just use white and neutral shades. 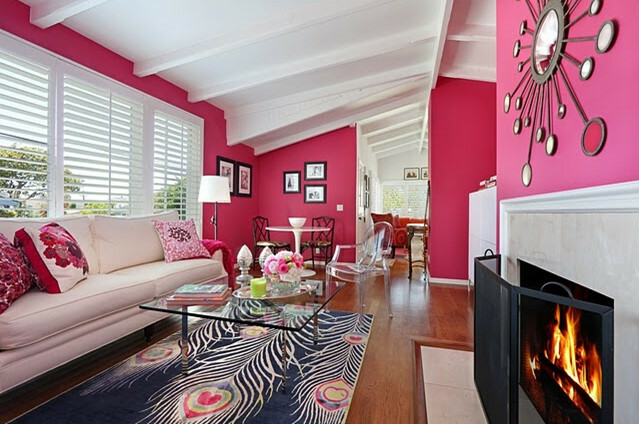 I even love the pink room, even though I usually hate pink. I think the contrast with the white beamed ceilings and the more refined furniture is great; plus I love the peacock feather rug. How cool is that pecock rug? And I love the silver in the bedroom. Hope you have a great weekend! Ack, now I have a new crush, too! 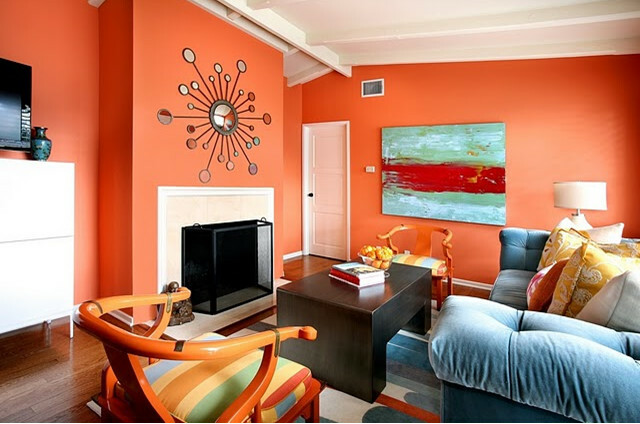 Love the color and playfulness, my faves in a room. Wow, thanks for the introduction! I have a stack of mags waiting to be read...T&C is one of them. Love the chair backs in that 3rd image and really love that second image. The colors are a real pick me up! The kids's rooms are great! Love the Nurseryworks furniture pieces in the Turquoise room too! I'm dying for that family couch in the game room! Holy cow, loving that kids room for ME!! Love her too! Wish I knew you had been in CA - I live super close to Pasadena!!! thank you so much for your kind words...it's always exciting for me to know that people appreciate my work. happy new year everyone!